Red Bull Kart Fight night 3 in Texas is in the books! Yet again another great turnout in both Austin and Houston locations. The TOP racer from Austin and Houston will be invited to the Nationals! The winner of the Nationals will receive a Red Bull Racing experience at Formula 1 in Austin, TX. The winner of each National race will also go on to the World Finals, to race for the chance to be titled Best in the World! Remember, only one qualifier left, Thursday October 11th! 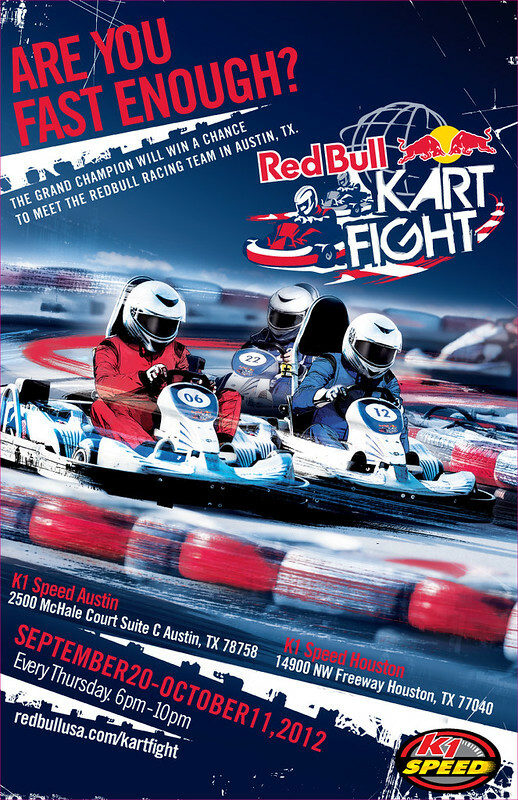 So race on over to K1 Speed Austin and Houston! Check out the TOP 10 fastest times from Thursday, October 4th at the following K1 Speed Texas Centers. Anyone between the ages of 13 and 35 can participate and could have the opportunity to defend the national colors at the world final. September 20 — 6:00 p.m. – 10:00 p.m.
September 27 — 6:00 p.m. – 10:00 p.m.
October 4 — 6:00 p.m. – 10:00 p.m.
October 11 — 6:00 p.m. – 10:00 p.m.